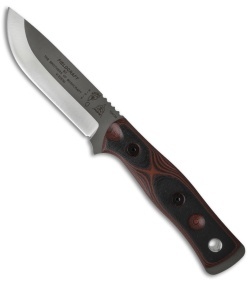 This model of the TOPS Knives BOB Fieldcraft fixed blade sports layered white/red G-10 scales and a gray finished blade. 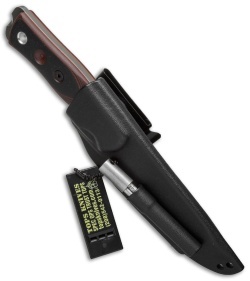 It includes a Kydex sheath and a firestarter set. The knife is ten inches long in total, with a blade length of four and a half inches. 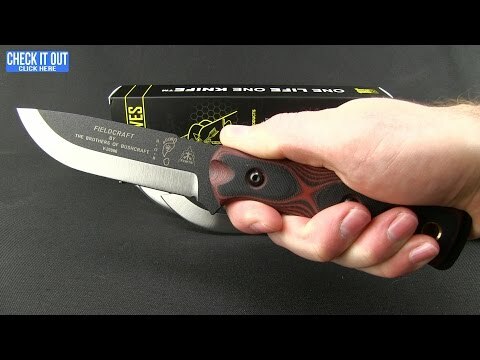 This makes a compact, but extremely serviceable knife. The Fieldcraft's blade is 3/16" thick, and made of 154CM stainless steel. The cutting edge is a modified Scandinavian Grind, which is very effective for carving, skinning and other general woods work. With a rockwell hardness of 56-58, the ease of sharpening is astounding. That is if you ever get to sharpen the blade. As the hardness and edge geometry work beautifully together to make a long lasting edge. The handle is one of the most ergonomic ones on the market, sporting several useful additions. Although knives with a lot of frills often end up lacking, the additional items found on the Fieldcraft knife were selected from experience and critiqued in every step of design, development and production. Being made of G-10, the handle will never let you down. The bow drill divot on the handle is frictionless and makes starting those primitive fires almost effortless. The "Thumb Scallops", formed on the hilt of the handle offer more comfort and control when using specialized carving and skinning grips. The pommel of the blade is simply the tang of the knife exposed enough to allow impact from a baton to not effect the handle (though the G10 is definitely tough enough to take such abuse). On the exposed pommel, you will find a scraper specially designed by one of The Brothers of Bushcraft, for striking Ferro rods in a safe and efficient manner.